Wireless display technology has already removed barriers to content sharing that were an artifact of the traditional single-user, one-source, video-cable approach to display. However, wireless display solutions have largely focused on the in-room use case and, as a result, meetings that involve co-workers in other locations must revert to serialized, single content sharing with video teleconferencing software. While video teleconferencing solutions are appropriate for voice and video calls with limited content sharing, they were not designed for collaborative, content-heavy meetings that regularly occur between teams and groups of individuals within the same organization. 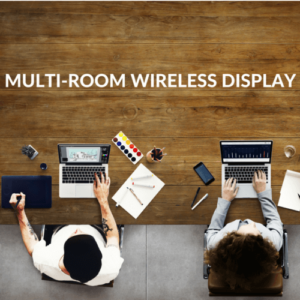 Here we outline how Solstice wireless display has been extended to support multi-source content sharing across multiple rooms and locations, including seamless context switching via a simple user interface. We also cover how Solstice Multi-Room wireless display is designed to leverage existing video and voice conferencing solutions to support the full spectrum of conferencing needs for most meeting types. What Problems Does Multi-Room Wireless Display Solve? The Solstice Multi-Room extension addresses a common meeting type that, until now, has not been properly addressed by wireless content sharing or video teleconferencing solutions. This meeting type is defined by content-centric collaborative sessions between co-workers that are frequent, ad hoc, and can be informal. This extension to Solstice leverages existing investments in enterprise networks, voice conferencing solutions, and even video teleconferencing to allow Solstice users to collaborate across multiple locations. The development of this extension focused on a simple user experience with an intuitive workflow that mimics the simplicity of Solstice when collaborating in a single location. As a side effect to this workflow, users can discover ongoing meetings from their co-workers. This allows individuals to find new opportunities to collaborate with their colleagues, something we believe is increasingly important in the modern workplace.